1. In a small saucepan, bring the maple syrup to a boil. Lower the heat and simmer until reduced by half, about 3 minutes. Pour into a bowl, then stir in 1 stick butter and the chopped time. Freeze for 30 minutes. 2. Position a rack in the lower third of the oven; preheat to 400°. Place the turkey, giblets and neck on a rack in a large, heavy roasting pan. Season with salt and pepper. Using your fingers, gently loosen the skin from the breast and spread about half of the maple butter on the outside. 3. In a large bowl, combine the onions, celery, thyme sprigs and salt and pepper to taste; fill the turkey cavity with two handfuls of the onion mixture. Tie the drumsticks together with kitchen string; tuck in the wings. Scatter the remaining onion mixture around the turkey and pour 1 cup water into the pan. 4. Place the turkey in the oven and lower the temperature to 350°. 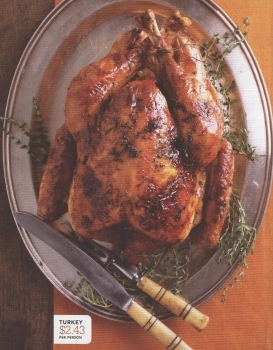 Roast, basting with the pan juices and 1 cup cider, until an instant-read thermometer inserted in the thickest part of the thigh without touching the bone registers 165°, about 2 hours and 40 minutes (during cooking, cover loosely with foil to prevent overbrowning). Transfer the turkey to a platter and let rest. 5. Strain the pan drippings into a large glass measuring cup; discard the solids and skim off any fat. Add enough chricken broth to make 3 ½ cups of liquid. Set aside. 6. In a small bowl, combine the flour and remaining ½ stick butter. Place the roasting pan over 2 burners, add the remaining 1 ½ cups cider and cook over medium-high heat, scraping up the browned bits. Lower the heat to medium and cook, stirring, for 4 minutes. Slowly whisk in the butter-flour paste and the reserved pan juices. Cook, whisking, until thickened, about 10 minutes. Season with salt and pepper. Serve the gravy with the turkey. 1. 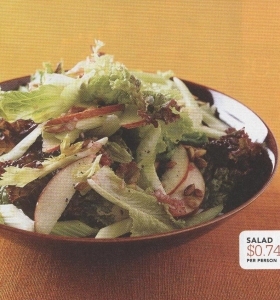 In a large salad bowl, whisk together the olive oil, vinegar, shallot, ¾ teaspoon salt and ½ teaspoon pepper. 2. Add the celery and apples and toss. 3. Add the lettuces and toss again. 1. Position a rack in the lower third of the oven and preheat to 325°. Lightly coat a 9-inch springform pan with cooking spray. Using a food processor, grind the cookies with 1/4 cup sugar. Add the butter and pulse to combine. Press the mixture into the bottom and halfway up the sides of the prepared pan. Bake until firm, 3 minutes. Transfer to a rack to cool. 2. Using an electric mixer, beat the cream cheese and remaining 1 1/2 cups sugar until smooth, about 1 minute. Beat in 2 eggs until blended. Transfer 1/4 cup of the cream cheese mixture to a small bowl and set aside. Add the remaining 3 eggs, the pumpkin, vanilla, pumpkin-pie spice and salt and beat until combined, 2 minutes. 3. Set the springform pan with the cooled crust on a double layer of heavy-duty foil and wrap the foil tightly around the bottom and sides; set in a roasting pan. Pour the cheesecake filling into the crust. Dollop the reserved cream cheese mixture onto the filling and, using the tip of a knife, swirl together. Transfer the roasting pan to the oven and fill with enough boiling water to reach about halfway up the sides of the springform pan. 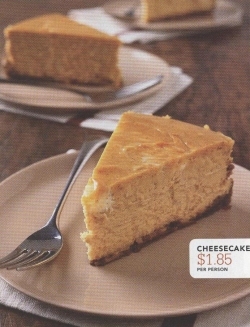 Bake the cheesecake until the center is slightly wobbly but the edges are firm to the touch, about 1 1/4 hours. 4. Transfer the roasting pan with the cheesecake to a rack and let cool for 45 minutes. Remove the springform pan, discard the foil and let the cheesecake cool on the rack for 3 hours. Run a knife around the edges to loosen the cake. Wrap the pan in plastic wrap; refrigerate overnight. 5. Remove the springform pan sides. Run a knife under the bottom of the cake to release it, then slide onto a serving platter.